When it comes to bedtime, helping youngsters deal with nightmares can be tough. Harry and the Monster is a delightful and funny book that just might help. The first night, Harry has a bad dream about a scary monster. Each night afterwards, he is afraid the monster will interrupt his dreams. No matter what Mom and Dad suggest, that monster keeps ruining all his dreams and wakes him up. But one night, Harry thinks he and Dad have come up with a great solution to change everything. Both of my girls went through nightmare stages. I wish I had this book back then. Mongredien is smart to tackle the monster issue with ideas other parents have probably used in the past: Mom says to imagine him wearing something silly so he won’t be so scary, Dad checks under the bed to make sure he’s not there, etc. This helps the story make sense to kids. Their parents have probably told them some of the same things. 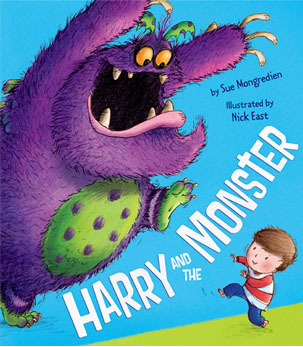 East also makes this book work by drawing the monster and his antics in such a zany manner that kids will be laughing more than scared of what’s going on, all the while relating to Harry’s fears about the monster. I loved this book beginning to end.